I came across your website by way of referral from a member on a Keystone RV forum. I have a concern regarding upgraded tires and wheels for a Keystone trailer I own. As most manufacturers continue to cut costs in value models, wheels and tires seem to be ground zero in their savings. So, to help mitigate tire failure on my coach, I've upgraded my china bomb OEM 14" tires sized ST205/75R14 LR-C to ST225/75R15 LR ? and purchased new wheels to accommodate the new rubber. My wheels are Sendel wheels that support 2540 lbs of load each. I purchased Carlisle Radial HD tires in LRD from Discount Tire. Unfortunately, they received LRE tires in instead of the LRD tires. The Discount Tire salesman quickly resolved the error and within 2 days, had LRD in stock. I returned to the store to have them balanced and mounted on the wheels. The stock they received in had DOT date code of 1516. He told me that was the newest in all his warehouses. I didn't want year old tires so I rejected the sale. Then, I ordered the same tires from Walmart.com. Same story, the DOT date code was 1616 and 2016. Rejected that sale. Finally, I ordered them from Amazon.com. They arrived today. Again, tires are around 1 year old and I'm sending them back. My first attempt at ordering tires from Discount Tire resulted in LRE tires. They were much newer around Nov 2016. I think my quest for load rated D tires from Carlisle in size 225/75/15 is futile. So now, I'm considering purchasing the LRE tires as I think the local stock is much more fresh than I can ever find with LRD. The only limit I have is my wheel capacity at 2540 lbs. If the LRE tire max inflation pressure is 80 lbs supporting 2830 lbs, will it compromise the tire if I inflate only to 65 lbs (in order to stay within the specs of the wheel)? The OEM tires were LRC on 14 inch wheels supporting only 1760 lbs at 50 lbs. Weight is not a concern as I will never come close to max weight limits with my trailer on either LRD or LRE tire. Another thing that worries me is the stiffness in the LRE rubber. Comparing the Carlisle LRD to the OEM Trailer Kings is night and day. The tire is just so much more beefy. Don't really want to rip apart the trailer because it's rolling on unforgiving rubber. Any opinions and recommendations is greatly appreciated. OK you have a couple different issues. You need to know that tires are made in batches. For relatively small markets it's possible that a company may only make an item once a year or even less frequently. While tire age is of concern when the tires are on the ground and exposed to sunlight and heat, it's less of an issue when in the factory warehouse. One way to let your mind rest a bit is to ask when the warranty clock starts ticking. Some companies clearly state on day of application or first retail sale. Others say the warranty is based on DOT serial. If it's based on date of sale and clearly stated as such in the literature, I would be less concerned and just be sure that the sales receipt has the date and DOT serial of each tire identified and keep both warranty and receipt in a safe place. Now, since you have taken the step of going from the ST205/75R14 LRC to ST225/75R15 LRD, you have increased the load capacity from 1760 @ 50psi to 2540 @ 65 psi. You have increased the reserve load capacity by over 50%, which should deliver very reliable service. While I do not have any data to go on, I think that when inflated to the same psi the LR-D and LR-E would have similar stiffness. It's the air that supports the load and it's the air that provides the majority of the tire stiffness. For your application I would think there would be no problems with running LR-E tires at the wheel limit of 65psi. So, bottom line, I think you can go with the year-old LR-D tires or run the LR-E at 65. "I just bought a new TST 507 TPMS (tire pressure monitoring system) and I gotta say they could improve the documentation. Definitely confusing as setting up is a bit complex. At one point you are told to press a button and wait for the second beep (not the first!) before setting the pressures or whatever. But once that's over, it works as advertised. It does seem to take a while, once turned on, for all the sensor readings to be displayed. After that it just cycles through them every 5 s, and beeps when one is over or under. Not sure how accurate the psi readings are. Will have to get out my pressure gauge and compare." TPMS are primarily designed to WARN of a loss in pressure and are not intended to be your primary source of accurate pressure measurement. 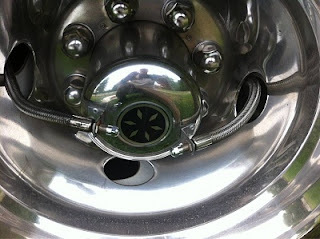 In my experience ALL TPMS will have one or more sensors reading a psi or two different than a hand-held digital gauge. For that matter even hand-held gauges are seldom accurate to +/- 1.0 PSI based on the calibration checks I offer at my tire seminars. IMO best practice is to set your tire pressure as close as possible to the desired CIP (cold inflation pressure) using your personal, master digital hand gauge and then install the TPMS sensors. Wait about 5 min for pressures and readings to stabilize, then do a pressure check on the monitor. You will note slight variation, but all should be within the specified range (some spec +/- 2% some spec +/- 2 psi) You will find that after a few days use you will get comfortable with the pressure readings showing some variation from each other. With a little experience you will get comfortable and know the range of normal variation. Each morning when I get up, I first turn on the TPMS monitor and go get my coffee. By the time I am done with the 1st cup - about 10 min - all the sensors have sent in a reading. I step through each tire on the system and based on experience, I know if the tires are ready to go as far as being properly inflated. Yes, the numbers vary, but as long as they all are in a range of a couple psi from what I got when I last set the tire pressure all is good. With the above practice I am getting the "cool tire" pressure reading which is the only reading of importance. With my +10% over the minimum inflation needed for my Motorhome, I don't have to worry about a daily +/- 2 to 4 psi variation. However, if I have a few days in a row with the display pressures consistently showing a few psi lower than my CIP goal I know it's time to plan on a stop at the truck stop for a shot of high pressure air.